Somewhere back in hoary antiquity, at least in the realm of modern technology, perhaps in the late ‘80’s or early 90’s, I was at a meeting of rabbis in Vancouver, British Columbia. Cell phones were still a curiosity, and turning the pages of books still more common in the quest for knowledge and information than online searches. Keeping in mind how far we have moved since that time, and holding the excitement and trepidation that comes with standing at the cusp of change, it is not surprising that I vividly remember the program that provided the learning content of that meeting. I have never forgotten that moment, often reflecting on where the question came from and of its deeper meaning beyond the way of its delivery. 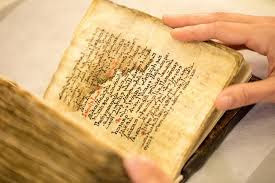 I was really asking about connection and of engagement, of the book as something precious beyond the words on its pages. It is not at all that I am against technological advancement. An important challenge is whether there is really advancement, or if in advancing in one realm we take a step backward in another. Once having fancied myself as a Luddite, I fully acknowledge that I am no longer part of that club. 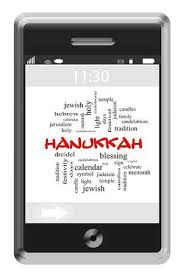 I use a smart phone, delighting in texts of another sort, which at times are also holy, my Shabbos text messages to my children remaining my phone’s most important weekly use. I certainly use online searches for both Jewish texts and general information. The concerns raised by my younger self’s insensitively asked question, are concerns that need to be asked in regard to all technology. For every technological advancement, so many of great benefit, but not all, we need to ask what steps are we are going to inadvertently take in the other direction, remembering to ask what will be lost? It is well recognized that as a society we have become far more solitary in our constant use of electronic devices. Staring at a screen for so many of our waking hours, dare we ask how much direct contact with people is lost? 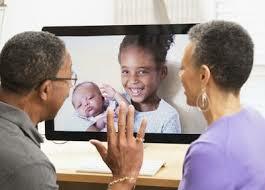 While Skype and FaceTime are miraculous in allowing us to see people far away, we also quickly realize their limitations, as in seeing grandchildren in Los Angeles, yet remaining unable to touch them. I cried with that realization a few years ago when we helped my dad (of blessed memory) to Skype with his great grandchildren. At one point, without any sense of irony, he reached his hand to the screen and began to caress the little ones brought to him on beams of light, their images refracted now through crystal tears. I had not thought to go in this direction as I reflected on the nature of technology. More sinister questions had been on my mind in reading the weekly Torah portion of No’ach (Gen. 6:9-11:32). The portion begins with a very familiar story, earth so filled with violence that it could not be sustained, a great flood destroying all that was and had been, No’ach told to build an ark, then riding out the storm, preserving life and the possibility of its future. By the end of the portion, violence and arrogance have again filled the earth. God has promised never again to destroy the earth, yet waiting for us to make the same promise. At the end of the portion people come together to build a mighty city with a great tower whose top shall reach to the heaven… (Gen. 11:4). The defining purpose of their endeavor is carried in the words that come next, and let us make a name for ourselves…. Of their seeking to storm the heavens, the great commentator Rashi (10th century France) speaks of this as a war with God, interpreting their words to suggest, let us go up above and make a war with God…. This is in stark contrast to Avram’s intention in the next portion when in building an altar he then proclaimed in the name of God. The question for the most part is how we use our creative gifts, whether for good or ill. 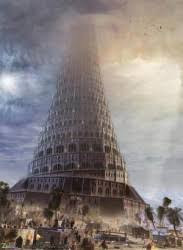 Speaking of those who built the Tower of Babel, the rabbis teach, their arrogance came from the good that had been given to them…. The question becomes how we use that which our minds and hands are able to create. Of the clay that is used to make the bricks for the tower, a Chassidic teaching looks at the word for clay, chomer, a word that is used to refer to all material substance. So we learn that the material realm needs to serve as a mediating influence, helping to strengthen the spiritual realm…. And yet, there is that which we have created that is a technological monstrosity, that which is evil in its essence, which threatens all life in its ability to undo all of creation in a nuclear flash. From the technology of online books and the search for knowledge to the technology of nuclear destruction is a long stretch, a reach across a chasm of diverse realities. The common denominator is to be aware and wary in our use and celebration of technology, to recognize the limits of devices and what is lost in their use. 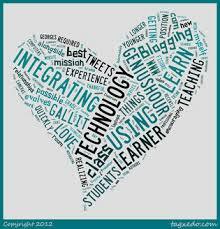 Even in using an online book, we can still sit with a learning partner and share in the joy of learning, words still to be as a bridge that joins. At times to take an old book and smell the page and feel the old print, inspired in the quest for knowledge whether with new medium or old. Neither at war with God nor with people, may we receive with humility the gifts of human hand and mind and infuse them with gifts of heart.